The Ogun state police command have arrested three suspected members of a notorious child theft syndicate. Their alleged leader is a woman who is currently serving her time in an Ondo prison for another case of child theft. A statement released by the police command spokes person, DSP Abimbola Oyeyemi, says the syndicate's modus operandi was to carry out a surveillance of areas where their age-target of children were concentrated, following which, two members of the syndicate, a man and a woman, would pretend as a married couple in search of an apartment. Nobody would ever suspect them to be kidnappers. They would deceive the unsuspecting members of the society and then kidnap these children successfully. 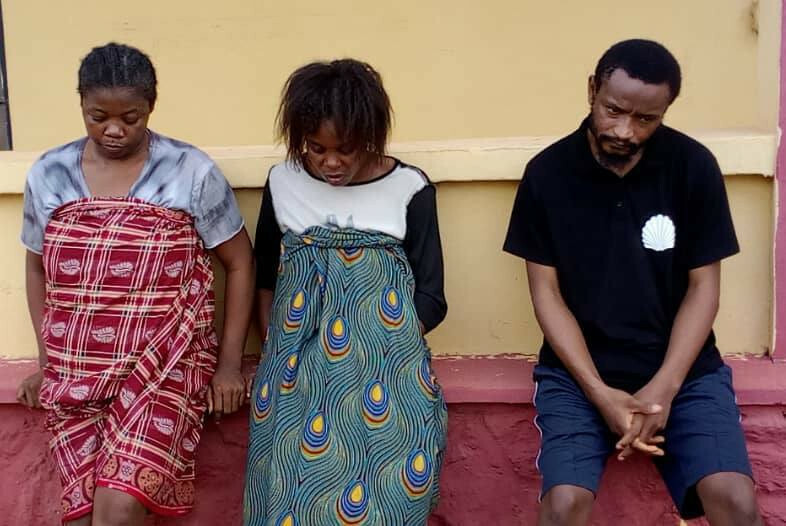 "Operatives of the Anti-kidnapping/Cultist Unit, who were mandated to track the syndicate, embarked on a high technical investigation, which paid off with the tracking of the group leader, one Mary Paul, in an Ondo prison. Through synergy with Ondo Police Command, relevant information was extracted, leading to the arrest of three members of the gang, who actively participated in the theft of eight children across the State", the statement revealed. According to the PPRO, the said Temidayo's brother was still being sought for by the Police, adding that the suspects had all made useful statements to the Police on how they perpetrated the wicked act.